File this one under “for what’s it worth,” but we find it interesting. It’s difficult to reach many conclusions based on this data, but at a minimum we feel safe suggesting that if you’re a player at Marquette under Wojo and you’re scoring the ball well on any given night, you will have the opportunity to put up big numbers. In 2014-15, Marquette had six different players score 20 or more points in a game. Only three teams in all of D-I college basketball had more players reach the 20-point mark (Davidson , Louisiana-Lafayette and North Florida – each had seven). Through December 21, the 2015-16 season had seen five different Warriors hit the 20-point mark. Only three teams had more players reach 20 points in a game (Colorado, Detroit Mercy and Northern Colorado – each with six). Marquette redshirt sophomore guard Duane Wilson is likely to join the group as he did in 2014-15, but thus far his high is 18 points. Wilson has scored double figures in nine of 11 games this season; he’s scored fewer than nine points in only one contest. This year’s Marquette team features high-usage Henry Ellenson (27% usage, 30% %Shots), but when other guys are stepping up they have been allowed to keep firing. The other four of MU’s 20+ point scorers this year each have a sub-20% usage. After reading through Cracked Sidewalk’s Deconstructing the Season So Far article which commented on Marquette’s recent trends in actual offensive and defensive efficiencies, we decided to take a quick look at Marquette’s adjusted efficiencies (adjusted based on opponents’ Adj OE & DE). CrackedSidewalks (“CS”) makes some points about individual factors and their related concerns. The commentary is good and valid, but we’ll throw out some additional food for thought. ♦ The last 5 games included 3 against tough competition (Syracuse; Notre Dame twice) and the other two were on the road. ♦ Marquette’s eFG% hasn’t been consistently great (although the 64.9% eFG vs. Notre Dame in Milwaukee was a Big East season best), but it’s been solid. Their worst performance in the past 11 games was at St. John’s. While not a good team overall, the kids from Queens are very good defensively and have the nation’s top shot blocker (block %) in Chris Obekpa. MU made 22/45 2FG for 48.9% despite being blocked 11 times, including 7 alone courtesy of Obekpa. ♦ Turnovers are ugly, there’s no denying that. While that’s how the 5-game trend calculates out, the reality is that Marquette’s DR% has improved sequentially in its past 4 games (Opponent’s OR% starting 5 games ago to most recent: 45.5%, 43.6%, 40.0%, 36.2%, 31.6%). It’s worth noting that the 45.5% belongs to Syracuse, one of the best OR% teams in the nation. ♦ Finally, a subject we don’t like to give much time to because it’s so far down on the list of factors important to winning a basketball game: Free throws. CS comments that they are “leaving out FTR, because it’s irrelevant (repeat after me: FTR is irrelevant).” Normally, we’d love this comment and often make similar statements. 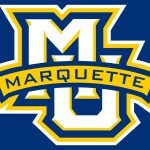 However, getting to the line may be more important for Marquette than it is for their peers. In terms of correlation of FTR to OE, for all Big East teams combined excluding MU the average is +.005 over the last two seasons. The Warriors sit above +.040. Free throws aren’t a big deal at the end of the day. However, for a team like Marquette that isn’t a dominant squad, the FTR differential can become more of a factor in games than it might for others. This team earned its 14-4 conference record, but it’s still a bit surprising/impressive that they were able to do it. 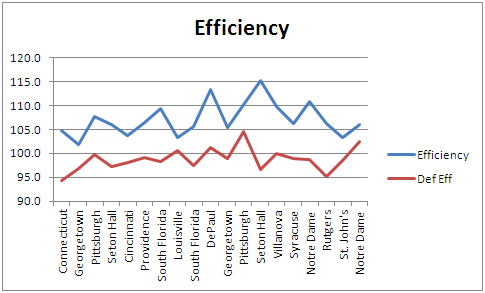 Despite an ugly turnover rate in conference, MU’s offense still had the Big East’s top efficiency. Were eFG% and OR% more important than FTR? Absolutely. But to call FTR irrelevant to this Marquette team is something we can’t quite do. This MU shooting shirt & other gear is ON SALE at the link below! Some cut & pasted data is included below, should anyone want it. 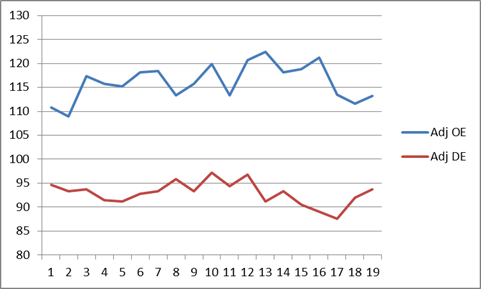 Adj OE, Adj DE for each Big East game is shown, as is the 5 game differential and the specific, one game differential. Tubby Smith blasted his team’s defense after they gave up 1.29 points per possession to offensively-challenged Purdue in yesterday’s 89-73 loss. Purdue’s best offensive performance this season prior to going off on the Gophers was 1.19 points per possession. After the game Smith commented that this might be his worst defensive team since arriving in the Twin Cities. Today we take a look at both Minnesota’s defensive and offensive efficiency during Tubby’s tenure. Back in January we discussed the difference between raw and adjusted efficiency. A point of that article was that Minnesota’s adjusted defensive efficiency per KenPom.com benefited from some assumptions that didn’t align well reality. That is, Minnesota’s defense was held in a higher regard than it should have been. In looking at the history of the Gophers’ raw defense during the Smith years you’ll see the numbers haven’t been very good since the days of Damian Johnson (whose senior year was 2009-10). This might be a scary thought for some, but relative to offensive and defensive adjusted efficiency this season has easily been one of Tubby’s top two (only 2009-10 comes close) and arguably his best. 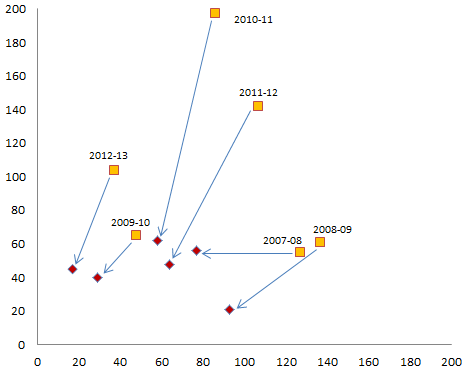 The graph below plots the offensive & defensive rankings for each year (raw and adjusted). New article is now up at GopherHole.com. It takes a look at Minnesota’s Trevor Mbakwe’s impressive work on both the defensive and offensive glass this season. Below is just one of the tables included in that article. It shows total rebound percentage leaders among the six “BCS” conferences over the past four seasons and each player’s current status (NBA lottery, first rounder, second rounder, undrafted… or current college player). Averaging both 24% DR% and 16% OR% as Mbakwe is doing this season is quite rare. See www.valueaddbasketball.com and Breitbart Sports for further information on Value Add Basketball. “Having healthy bodies available is not the same thing as having great depth. We believe there are two optimal lineups (depending on the opponent) for Minnesota this year and also believe that Minnesota’s best players can add significantly more value than the rest of the roster. Minnesota and Indiana are the only teams with 4 players in the top 20 of Value Add. While the Hoosiers are the top team in the nation, the Gophers are sitting alone at 8th place in the conference. Minnesota has plenty of talent and, on balance, they have gotten very good production out of that talent. However, the bizarre utilization of their roster has cost them games. 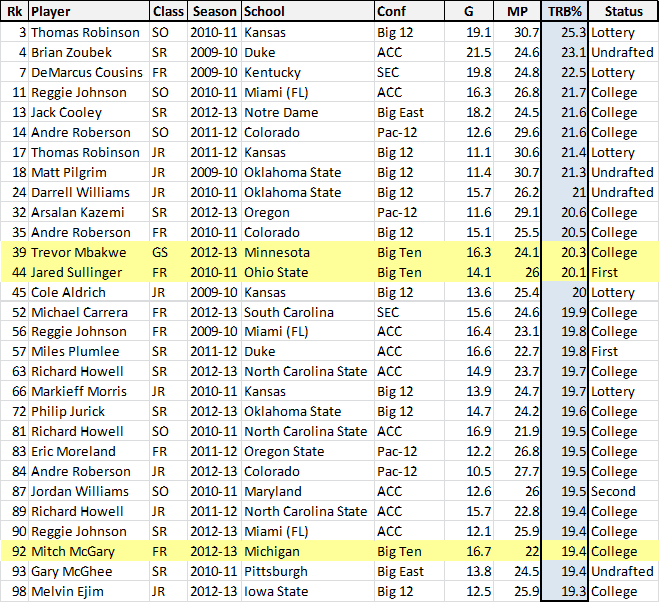 Only one freshman – Michigan’s Glenn Robinson – is in the Value Add top 20. Other top freshmen (although outside of the top 20) include Gary Harris, Nik Stauskas, Sam Dekker, Mitch McGary and AJ Hammons. We know the story: The Gophers are great at offensive rebounding, not terrific at defensive rebounding. The facts don’t change – Minnesota is great at earning second chances. However, against most competition they are not gaining a big advantage on the boards and in fact have been outrebounded (OR%) in five of their 12 Big Ten games this season. In early December we wrote Andre Hollins: A Tale of Two Games? which looked at Dre’s stats for all games excluding Memphis and South Dakota State games. Today, we’ll do the same. As discussed in the earlier article, Joe Jackson of Memphis played just seven minutes against the Gophers and was on the floor at the same time as Andre for less than five (4:38). Also, SDSU star Nate Wolters did not play at all due to injury. In his place the Jackrabbits started a true freshman who turned the ball over seven times. Dre has had several high-scoring games other than the two that are excluded below. However, the splits of (1) the Memphis & SDSU games compared to (2) all other games are interesting. Even after 19 games, it’s apparent what a big factor the Memphis and South Dakota State games have on Dre’s 2012-13 statistics.